One of the easiest to make yet most popular baby finger foods is the cheese toastie, more commonly known as grilled cheese in America, where it made its first appearance in the early 1920s. Whilst the idea of serving cheese with bread has existed throughout history, the decision to grill and melt the cheese raised the bar to a whole new level. 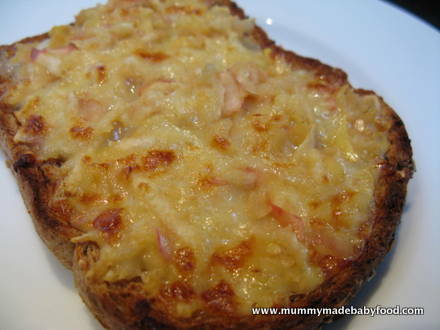 There are many variations of the cheese toastie, but when it comes to preparing baby finger foods, an open-faced (i.e. without the top slice of bread) format is probably best. Babies don't learn how to properly eat a sandwich until they reach the toddler years, and a closed sandwich will likely be too thick for your baby to get into his mouth. The recipe below is a great way to combine fruit and protein. I like to serve it for the evening meal, when everyone's tired, and I just need to get some food into my son quickly! I used wholegrain sliced bread and opted not to use any butter, as the cheese and apple together provide enough moisture, but feel free to play around with whatever combination works for you and baby. Note that it is not necessary to first peel the apple before grating it, although you can, of course, if that is what baby prefers. 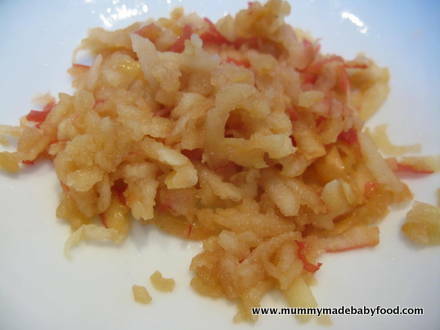 If you are not peeling the apple, then make sure the bits of skin are small enough for baby to chew and swallow easily. 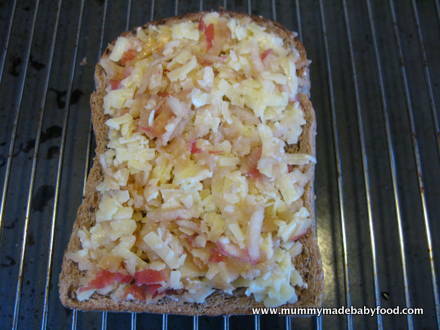 You can make this toastie with whatever apple variety baby likes. 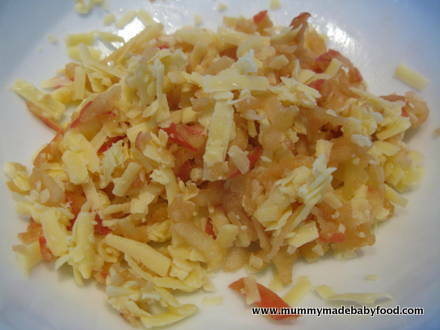 This recipe yields one Cheesy Apple Toastie but an easily be scaled up if you are making this for more than one child. Lightly toast the bread in a toaster, and spread with a thin layer of unsalted butter, if desired. Grate the apple into a bowl. Then grate the Cheddar, and mix together with the apple. Pile the cheese and apple mixture on top of the toasted bread. Place the dressed bread under the grill for a few minutes until the cheese has melted and starts to bubble. Turn off the grill when the cheese has started to brown slightly. Allow sufficient time to cool before serving. You may wish to cut the toastie into smaller pieces before serving to baby.